Tysheem Johnson of Neumann-Goretti might be one of the city's best high school players ever when he is finally done in two years. Neumann-Goretti sophomore Tysheem Johnson hadn’t been accustomed to waiting his turn on the football field. The 5-foot-10, 180-pounder — one of the most recruited underclassmen in the city — had been an offensive standout since he threw his first spiral at age 4. 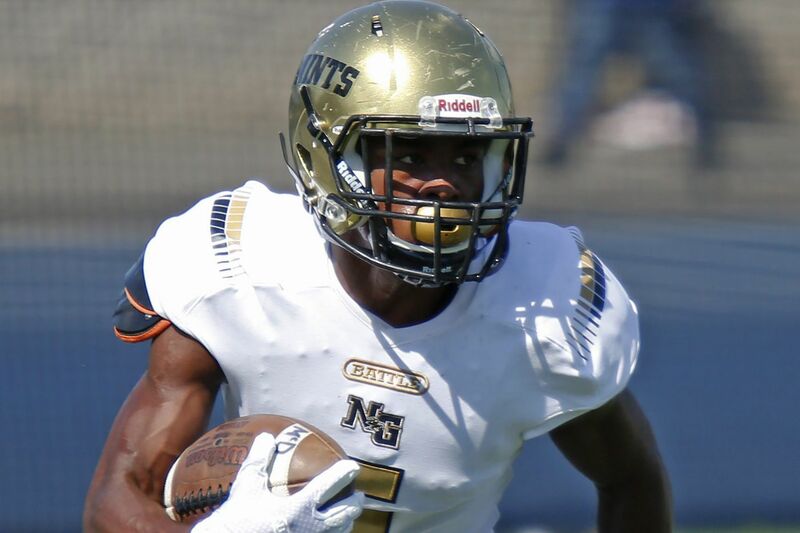 As a freshman for the Saints in 2017, however, Johnson played mostly defensive back, because two talented seniors occupied the depth chart’s top spots at running back. So, when, after two cancellations, the Saints finally played their first game last season in September, the fleet-footed multipurpose threat, now with a role on offense, could hardly contain himself. The proof was a record-setting, six-touchdown performance, including his favorite score, an 80-yard kickoff return, in a 54-14 victory over Bonner-Prendergast. That jawn also sent Johnson’s recruiting stock streaking north. The University of Michigan offered Johnson a scholarship after that game, and Wisconsin followed suit days later. Maryland offered in October, while Baylor jumped in early, offering Johnson as a freshman. In January, Penn State, Florida, Pittsburgh, Ohio State, and others also offered scholarships. The regular period for signing national letters of intent starts Wednesday and runs through April 1 for Division I schools and Aug. 1 for Division II. Regarding recruiting attention, Johnson is in rare company, to be sure. But his coach, Albie Crosby, who has helped several talented underclassmen reach college and beyond, said Johnson could be the rarest of them all. That long list includes, among others, running back Curtis Brinkley, still the city’s all-time leader in career yardage (7,429 yards in 2003) after he graduated from West Catholic, where Crosby was an assistant; and current NFL players such as receiver D.J. Moore and running back David Williams, now with the Carolina Panthers and Jacksonville Jaguars, respectively, after each was coached by Crosby at Imhotep, which he led from 2012 to 2015. In May 2018, Young, once a Penn State commit, pleaded guilty to multiple counts stemming from his 2017 arrest in connection with an armed robbery at a South Philly Wawa. The deal moved the case of Young, who was 17 at the time of the crime, to juvenile court. In a separate conversation unrelated to Young, Crosby said he talks to Johnson and all of his players about making good long-term decisions. When it comes to recruiting, Crosby’s advice is simple. Johnson, who spoke with a laid-back cadence that matches his demeanor off the field, appears a quick study. When college coaches first engaged him, Crosby warned that Johnson’s laid-back way could come across as a lack of interest. Last year, the question of which position Johnson would play eventually led to an answer that Crosby said could portend greatness. Tysheem Johnson scores a touchdown in 2017 against Bishop McDevitt. Since he was about 6, Johnson had been a standout quarterback who mostly ran. It was his godfather, Nate Washington, who took him to play for the Nicetown Titans. After that, Johnson ran all over opponents, eventually joining the North Philly Blackhawks and leading them to a Pop Warner national championship in 2016. But, as a freshman, Johnson came in behind star running backs Leddie Brown (now at West Virginia) and Chris Wells (now at St. Francis). Instead of pouting, though, Johnson played defensive back. All he did was lead the city with eight interceptions. "I learned that I can play more than one position,” Johnson said. This past year, the Saints had just three seniors and relied heavily on Johnson, who scored 15 touchdowns (seven rushing, six receiving, kickoff and interception), added 358 yards on 39 carries (nine yards per rush) and led the team with 455 yards on 23 receptions (19.7 per catch). His six-touchdown performance marked the first time in Catholic League history that the feat was achieved by a sophomore, according to TedSilary.com. Johnson has the full support of his mother, Shanaya. Nine other players have scored at least six touchdowns in PCL history, most recently St. Joseph’s Prep graduate D’Andre Swift (2016), now a star at Georgia who many assume is destined for the NFL. Johnson, who says he isn’t distracted by all the early attention, hopes to be there someday, too. Until then, he’ll measure satisfaction in maternal joy.